Enhancing your smile can dramatically rejuvenate your entire appearance. Most people don't think of a smile makeover treatment as being an alternative to plastic surgery when in fact these cosmetic dental treatments can have a profound impact on the signs of aging and on your overall appearance in general. To schedule an appointment with our experienced Manhattan smile makeover dentists, please call NYC Smile Design at 212-452-3344. After performing a comprehensive smile analysis, our smile makeover specialsits, Dr. Elisa Mello and Dr. Ramin Tabib, can advise you on the best cosmetic treatment or series of treatments for your goals. 1. Assessment Photography: We utilize the best professional digital camera system to take complete series of photos to assess the relationship of the smile with facial features, assess the color composition of the teeth and the texture of teeth. Because the lower 1/3 of the face has a major impact on the perception of facial esthetics the role of a beautiful smile is undeniable and the proper photography allows us to evaluate it. 2. Assessment Imaging: Imaging of teeth are done to see how the changes we will be making fits with facial profiles and allow our clients to view it and give feedback. With imaging we try to show the objective of enhancement, to provide a restoration that fits harmoniously into the facial composition. 3. Assessment Waxup: This is the blueprint for the smile enhancement. It is created by taking extremely accurate imprints of teeth with a material that can actually reproduce the textural detail on a brand new dollar bill. 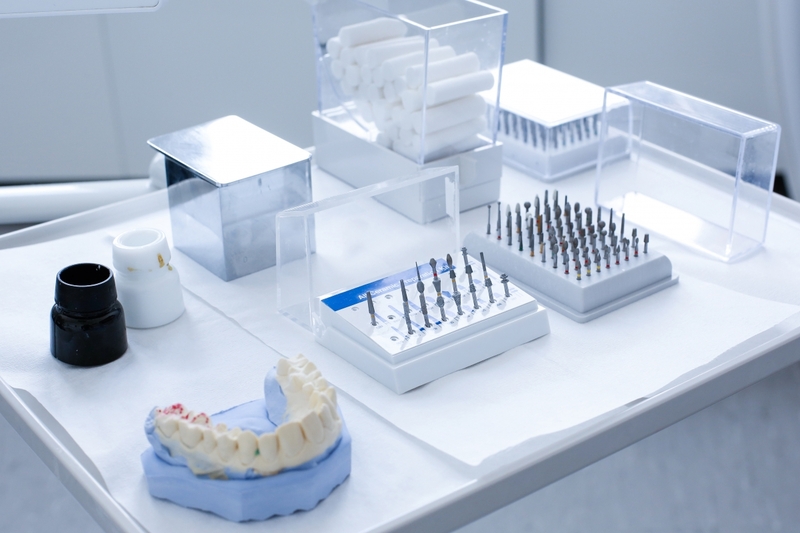 We determine and register how your teeth meet in function and chewing. This will help us to avoid any interference in the final smile makeover that could prove disastrous. We must determine how your jaw fits in your skull, for instance, is the upper jaw at a slant in relation to the rest of the face? This way we can avoid having teeth longer on one side and shorter on the other. All this information is communicated with the ceramist who will make the waxup blueprint and actually create the final restorations. The ceramist technician is so important that we have contracted with one of the best in the world. They use all the information we give them to create the most flattering and attractive smile. Once the ideal relationship between the restoration and the facial soft tissues is achieved improvements in natural beauty can be expected to follow. 4. Diagnostic mock-up: With the application of a special tooth colored material, we can temporarily change the shape, length and spacing of teeth. 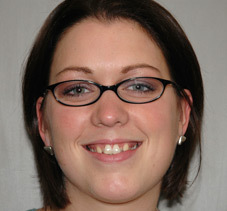 This allows you to see right in the office how an enhancement of your smile affects the overall appearance of your face. 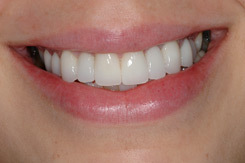 Here is a case from start to finish detailing the process for Liz’s veneers. The first thing we like to do is image Liz’s smile. This gives us a good idea and an initial preview of the final result. Although this is a very rough idea it is the beginning process of developing the smile. These are images of Liz with temporary veneers on them, which are placed after the teeth are prepared to accept the porcelain veneers. These temporaries allow us to preview the final result. These temporaries are a duplicate of the sculpted wax-up models and are made of acrylic. Once these sculpted wax-ups are transferred in the mouth as acrylic temporaries it will allow us to critically evaluate them and see what refinements, if any, are necessary. Now our ceramist begins the process of creating these natural appearing and life-like veneers. It is important to understand that these veneers are completely individual and can be flossed in between. What is also nice about porcelain veneers is that they are very cleansable, so much so that plaque and calculus does not adhere to them as easily as they can to your natural teeth. At NYC Smile Design we realize that every face is unique and therefore can’t prescribe a generic set of teeth to every smile facial features have to be carefully evaluated to determine what works best for the individual. We believe our practice name is truly a reflection of what we do; “design smiles” not apply porcelain pieces. Cosmetic dentistry can be a life changing event which often times paves the way for career advancements and a greater zest for life. Cosmetic dentistry creates attractive smiles that function in a state of health. As cosmetic dentists, we can help you determine how to improve your smile, thereby looking better and feeling better about your appearance If your teeth are chipped, spaced or discolored, if their shape is somehow unattractive or if you simply want to have an eye-catching smile, we can give you the smile you once had or the one you always wished for. To learn if you are a good smile makeover candidate, please call our team at 212-452-3344. Dr. Elisa Mello and Dr. Ramin Tabib have provided gorgeous smile makeover results for patients from all over, including New York, Manhattan and all of the surrounding areas.